I recently finished my ninth and tenth pairs of socks. I feel like I should stop for a while, especially since I rarely wear socks in the summer. But I probably won't. I made this pair for Anne in her favorite color. I used the good ol' Schurch Double Moss stitch. Here is its Ravelry page. This is the second time I've used Dream in Color sock yarn. Their variegated yarns are the best ever; never any jarring contrasts or pooling. The last batch I used was called Gaia. It has been renamed Smooshy, and I think it is a little thinner than before. I automatically took out the larger size 1 needle (2.50 mm), but I think the 2.25 might have been better. Or maybe not. These socks also seemed a little smaller than usual. Maybe the 2.25 needle with 72 stitches instead of 64? I made the tenth pair for myself, because I REALLY needed some pink socks. Actually, I was seduced by the yarn I encountered at the Loopy yarn tasting described in the last post. 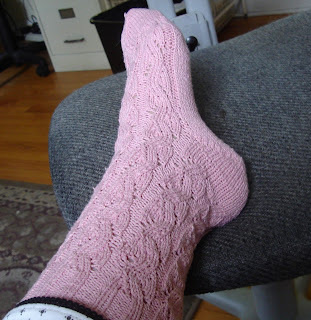 I used the Zigzag pattern from the Vogue sock book. I couldn't look away because the socks were also shown in pink. 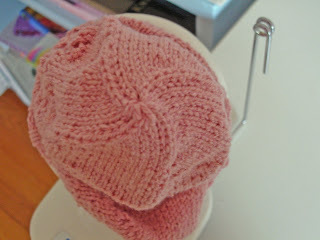 Here is its Ravelry link. A weird thing about this pattern was that the directions called for seven stitches to the inch for a size medium sock on 64 stitches. I think that would have made a large sock. So I followed the pattern, but at 8 stitches to the inch. Maybe the fact that the pattern used Gem sport weight instead of sock weight makes the difference, but I don't see how. Another weird thing was the star toe. This toe is what the designer used, so I thought I'd try it. I noticed that some ravelry people thought that this toe was so ugly that they frogged and reknit it. I thought, how bad can a toe be? Well, it is not a pretty or pleasant toe, way too pointed, but it looks like a cute little pinwheel off the foot. I won't use it again. Maizy by Crystal Palace is 82% corn fiber and 18% elastic nylon. The resulting sock fits well, is soft, and though it stretches out easily, it snaps back into shape really well when you take it off. One problem though. It feels like wearing plastic. Corn is a natural fiber, but like rayon, which is made from wood, it has a synthetic feel. The socks are pretty though. Here is more pretty. It's that time of year - garden photos! No deer this year (so far). My hostas are standing up proud. I, too, feel like I should stop with the socks and maybe get more done on my sweaters. In spite of that, I want more sock yarn. I saw some beautiful pink sock yarn yesterday. You're right about that Vogue pattern--it does look good in pink. I looked at it when I knit my Spring Forward socks and decided I preferred the Knitty pattern. They look similar, but I'll stick with the Spring Forward socks because they have a nice fit. Keep knitting the socks, they look great. I like your short-row heels. I'm quite fond of star toes, perhaps because I have a pointy-toed foot. Also delightful is Charlene's six-gore toe, which has six sections instead of the star's four sections. Love the pink socks . . . so pretty.